Preheat oven to 160°C (325°F). Place the flour, sugar, butter, eggs, milk and vanilla in the bowl of an electric mixer and beat on medium speed for 6 minutes or until pale and smooth. Spoon the mixture into 12 x ½-cup-capacity (125ml) cupcake tins lined with paper cases. Bake for 22–25 minutes or until cooked when tested with a skewer. Place on a wire rack to cool completely. ganache icing. Place the sour cream and chocolate in a large bowl and mix until smooth. Set aside at room temperature for 30 minutes or until cool and thickened. 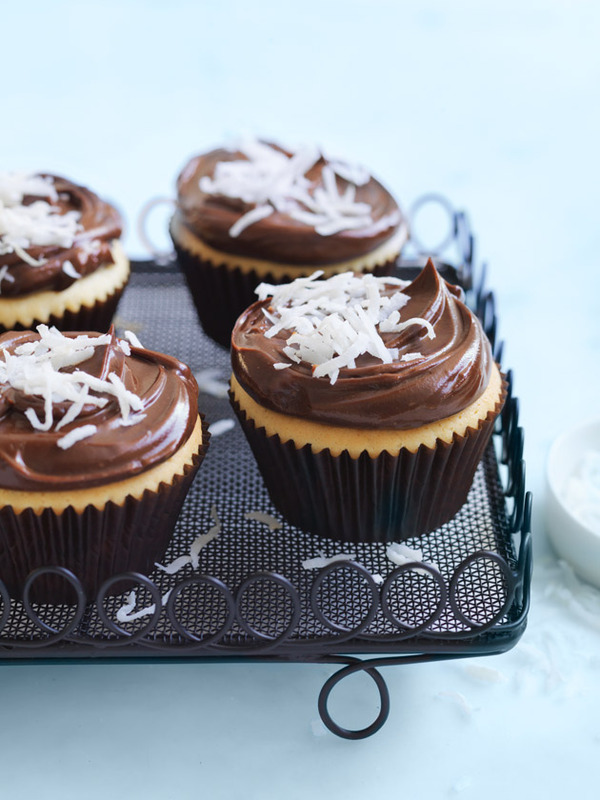 Using a palette knife, spread the icing over the cupcakes and sprinkle with coconut before serving. Makes 12.